Empire Dryden was a British steam ship of 7,164 tons which was completed in February 1942 and lost in April of the same year, just over two months later, North of Bermuda. She was built by William Doxford & Sons Limited of Sunderland, England as yard # 682. Though built for the Ministry of War Transport (MoWT), the ship was owned by Sir R. Ropner & Company, Limited (known as Pool Shipping) of West Hartlepool, Sunderland. Her dimensions were 443 feet long, 56.4 feet wide and 35.4 feet deep. Her triple-expansion steam engine developed 511 net horsepower and propelled the ship at between 10 and 11.5 knots. It was built by Fairfield & Company Limited of Glasgow. Her call sign was BCTN. Empire Dryden’s only Master was Captain Robert Powley, aged 35. Her Chief, or First, Officer was Christopher Thomas Valentine Rixham, also British. In fact all 51 men on board the ship were British. They included Gunner John Edward Snary, and two other DEMS or “Defensively Armed Merchant Ship” Gunners; John Raymond Brown, aged 19 and Dennis Brooks, 20. There were a handful of other teenagers on board, including Ship’s Boy Patrick Connor, Galley Boy John Colin Garrigan, Sailor Thomas Hanlon, Third Radio Officer Victor Leonard Longley, and Sailor John Mason. There were a total of six gunners (two army and four navy) and 45 merchant sailors. The gunners were responsible for maintaining and firing a four-inch gun, another 20-milimeter gun and four machine guns as well as an Oerlikon, 4 PAC rockets, 1 Gymbal projector and several kite rockets. The Empire Dryden began her maiden voyage from the United Kingdom on 27th February 1942 when she left Sunderland and joined Convoy FN 642, bound for Methil, Fife, Scotland. From there she joined Convoy EN 53, arriving in Oban, Scotland on the 4th of March. From there she sailed to Loch Ewe and Liverpool. The ship had no cargo at this point. On the 9th of March the Dryden sailed from Liverpool in Convoy ON 74 and arrived in Halifax, Nova Scotia on the 25th of March. There were 47 merchant ships and 10 escorts in this convoy. The convoy Commodore was Rear-Admiral F. B. Watson on the Hopetarn. From Halifax the Empire Dryden steamed to Boston in Convoy XB 5 between 27 and 29 March. From there she utilized the Cape Cod Canal to sail independently for New York, where it arrived on the First of April. In New York Harbor the ship loaded 7,100 tons of general cargo including grain and military stores including explosives destined for the Allied forces fighting Rommel’s army in North Africa. Her route was to be via Cape Town to Alexandria via the Red Sea and the Suez Canal. On Friday the 17th of April at 5:30 pm the Empire Dryden began her first laden voyage, heading on a course that would take her east of Bermuda per voyage instructions. At dawn on Sunday the 19thof April when about 350 nautical miles southeast of New York and halfway to Bermuda the Empire Dryden came upon a lifeboat with 21 survivors of the torpedoed and damaged Argentinian neutral ship Victoria, which had been attacked by U-201 under Adalbert Schnee the previous day and (prematurely it turned out) abandoned. Just as Captain Powley was preparing to retrieve the men his lookouts spotted the USS Owl (AM 2), a US Navy tug which had been towing a barge to Bermuda. The Owl then retrieved the men from the Victoria’s lifeboat and set about salvaging the ship, which was towed to New York, arriving 21 April. If they were not already, then the men of the Empire Dryden were now highly aware of the risk of U-boat attack, as they resumed their course to the southwards. Then, at 4 pm on the 19th, two days later, when just north of the island, those instructions were changed. Naval Control in Ottawa, Canada decreed that the ship was now to pass to the west of Bermuda. It took the Radio Officers on board roughly an hour to decode the signal. At about 5 pm course was altered a significant 30 degrees to starboard, to south-southwest. Roughly four hours later, at 8:55 pm ship’s time on Sunday the 19th of April 1942 the Empire Dryden was 195 nautical miles north-northwest of Bermuda, 475 nautical miles southeast of New York and 450 miles east of Cape Hatteras. Speed was 10.5 knots, the ship was completely blacked out, her “red duster” British ensign was flying, and the radio hadn’t been used since leaving New York (except to receive signals). The weather was fine and visibility reported as good. According to Chief Officer Rixham the Empire Dryden was not zig zagging, however to the Germans observing her movements from periscope nearby since sunset around 6:30 pm, she was. There were four confirmed lookouts: one in the crow’s nest high above the deck on one of the ship’s three masts, two on the gun platform at the stern, and between one or two officers in the bridge. They did not see a submarine in the dark, nor did they observe any torpedoes. The ship had unwittingly put herself in the sights of U-572 under the command of Kapitänleutnant Heinz Hirsacker. 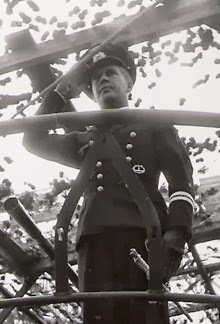 Kapitänleutnant Heinz Hirsacker of U-571. Hirsacker brought U-572 on a relatively long patrol north of Bermuda between the 3rd and 26th of April, 1942 – totaling 15 days. The patrol entered the Bermuda area on the 3rd of April, and the following day the British tanker Ensis of 6,207 tons, which was just damaged by gunfire and 20 millimeter shells. From the perspective of the men on the ship there was a “dull explosion” as, by their good fortune the torpedo struck about 15 to 20 feet under the water line in a cargo hold loaded with grain. It missed the hold carrying explosives. And two of the three torpedoes fired failed to find their mark, whizzing harmlessly beyond the ship. Third Officer Thomas William Money, aged 26, “reported seeing a flash and a tremendous column of water thrown up. It was too dark to see if any hatches were blown up or if there was any deck damage,” reported First Officer Rixham, aged 33. The torpedo hit on the starboard side, behind the number two cargo hatch and cut the bow of the ship off, as Hirsacker had observed. Back on the still-floating and still-moving stern section there was frantic activity. Captain Powley, realizing the ship only had minutes to float, ordered a general abandon ship. The team from the engine department took this literally and left the engine room before stopping the engines. Seeing a fully lit but abandoned engine room, he tried to use a lever on the boat deck to stop the engines, but the spindle bent and jammed in his hands. Together with some other shipmates they were able to slow down the engines to the point that boats could be launched. Third Officer Money was in charge of the boat and when Rixham finally stepped into it the ship was so low in the water that he merely stepped horizontally into the boat, which was full of sailors and gunners. Meanwhile, on the port side Captain Powley managed to launch the forward jolly boat, which was smaller than conventional lifeboats. Second Officer David Scott Whittet, aged 25, organized and successfully launched the port aft lifeboat, which was a motor boat. The men used their torches to stay in contact with one another. Shortly thereafter the aft section of the young disemboweled ship Empire Dryden sank to the ocean floor, roughly seven minutes after the attack began. All 51 of the men on board the Empire Dryden were able to get safely off the ship, with no serious injuries reported. They had been most fortunate, though less so than the men from the Victoria earlier that day, whose ship survived as well. Some of the men claimed that they saw two submarines half a mile apart signaling each other; one off the starboard bow (which had in fact fallen off) and one of the port quarter. Most likely they were witnessing the different boats trying to signal each other. They said the U-boat remained in the vicinity for 45 minutes, but did not approach them or interact with any of the survivors, which is consistent with the KTB. Rixham did say that they could hear the engine of the submarine running, which is creditable as there is no record that the motor in the motor life boat was ever used. “By noon the small life boat was making too much water and was unable to keep up with the two large boats, so the men from this boat were divided between the two life boats and the small boat was abandoned after taking out all water and provisions. After this transfer the Master has 26 men in his boat and there were 25 men in my boat.” The 25 men were composed of 3 gunners and 22 merchant seamen, amongst them Fireman/Trimmer James Swinburn. For over two weeks the men struggled against calms and storms. On the second day adrift Rixham’s boat lost contact with the Captain’s, however they reunited on Wednesday 22nd April. Calm settled over the sea from 1 pm that day until the next morning, when a strong gale of wind and waves set upon them, separating the boats for the last time. From 10:30 am on Thursday the 23rd until 6:30 am Saturday the 25thRixham streamed a sea anchor which worked until they pulled it in after the storm to find the canvas had been ripped off and only a metal ring remained. It is believed, after-the-fact and with no other explanation, that Captain Powley and the 25 other men in his boat were overturned during the same storm and perished. The men’s feet had begun to swell during the water immersion of the storm, however by massaging them with oil and with the kind ministrations of Second (Assistant) Steward James Charkley Dutton, the swelling was kept in check. Rixham described Dutton as “a valuable asset” who “looked after the stores and water in the boat and attended to the men’s feet and health…. being at all times resourceful and cheerful.” He also singled out Whittet, Bosun Norman Saunders, and Able Seaman David Henry Donneky for being upbeat and of assistance to him, particularly when a number of the other men became lethargic and despondent while drifting. Fortunately for the men in the lifeboat, the ship they sighted was the 5,861-ton US passenger and cargo steamer City of Birmingham, registered to Savannah Georgia and on a regular run between that port and Hamilton, Bermuda. Her Master was Captain Lewis Percy Borum. 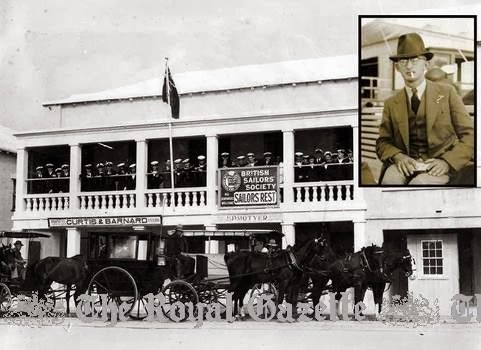 Rixham mistakenly described her as the “CITY OF BERMUDA”. On sighting her he wrote that “we immediately burned smoke floats, red flares, and a life jacket soaked in oil.” Such unusual efforts to attract attention probably saved their lives, as the ship was a good ten miles away at the time. Indeed it took over an hour for the ship to reach the lifeboat, but by 1:08 pm all 25 men were aboard the medium-sized liner. Their position was 30.37N and 77.15W, which is a bit south of a direct track from Savannah to Bermuda, being 215 nautical miles southeast of Savannah. Rixham proudly notes that they had managed to sail 450 miles over 16 days. In fact from the location of the sinking to rescue it was more like 630 miles. This would mean that the lifeboat averaged roughly 1.6 knots during their ordeal, which makes sense considering that much of the time they were merely drifting without adequate wind to propel them. Under the heading “Survivor Arrivals Here Elicit Wide Sympathy,” a journalist from “The Royal Gazette and Colonist Daily,” of Saturday May 9th relates for the public a thumbnail sketch of the loss of the Empire Dryden and the rescue of her survivors. As for the others, Rixham optimistically notes “…those landed here yesterday stated that the remainder are still unaccounted for, although there is every likelihood that they were picked up.” There is a factual error made by either the survivors or the journalist, who writes “….on the day the ship [Empire Dryden] was torpedoed they had picked up a group of survivors from another vessel [Victoria].” As we have seen, USS Owl and not the Empire Dryden picked up the Victoria survivors. The article is mostly dedicated an account of 256 survivors from the Lady Drake had been sunk by U-106 under Hermann Rasch on the 5th of May. Twelve died, but the same tug, the USS Owl which had rescued the Victoria crew and the ship as well, took the Canadian Lady Drake passengers and crew to Bermuda, landing them there on the morning of the 8thof May. The City of Birmingham was sunk by U-202 under Hans-Heinz Linder two months later, on 1 July, 1942. Out of her complement of 381 passengers and crew all but nine survived, rescued by the USS Stansbury and taken to Bermuda. On U-572’s return voyage to Europe the U-tanker U-459 refueled U-572, according to Wynn on the 23rd of April, but realistically more like the first week of May, as it occurred 500 miles northeast of the island and on the 23rd the sub was just north of Bermuda. This patrol began for the 3rd U-boat Flotilla on the 14th of March 1942 in Brest and ended there on the 14th of May. Hirsacker was born in 1914 and was a member of the Crew of 1934. He received the U-boat War Badge of 1939. In his early career he served aboard U-36 in 1937 and then U-64 under Schulz and later aboard U-124 under the same command. He took over U-572 in May 1941. Following a number of lackluster patrols and one in which he fabricated the log and remained submerged most of the time, Hirsacker was court-martialed in Paris while being re-assigned to destroyers Hans Lody and Z-33. Found guilty of cowardice and sentenced to death, Hirsacker chose to take his own life instead, which he did on April 24, 1943. Over six patrols and 267 patrol days Hirsacker sank 3 ships of 14,813 tons and damaged another of 6,207 for a total of 21,020 tons, all of them in early to mid-1942 and three of them on this patrol. Mitchell, W.H. ; Sawyer, L.A. (1995). The Empire Ships. London, New York, Hamburg, Hong Kong: Lloyd’s of London Press Ltd.